RLPB 337. November update. Incl. India, Australia, Bangladesh, Burma, Nigeria, Russia in Syria. * INDIA (RLPB 334), where violent persecution continues to escalate because of Hindutva (intolerant Hindu nationalism). During the winter sitting of the parliament, Hindu nationalist MPs of both the upper and lower houses plan to introduce a private member's bill banning conversions. UPDATE: The parliament will sit from 26 November to 23 December, commencing with a two-day discussion on the constitution, to commemorate its adoption on 26 November 1949. The opposition has vowed to raise the issue of 'intolerance' -- an issue the government is dismissing as an illusion created by the opposition for political purposes. With Indian actors and writers increasingly speaking out against intolerance, pray that the plight of Christians will not be overlooked or disregarded. * CHINA (RLPB 335), where repression is escalating as President Xi exhorts the ruling Communist Party to 'attain the goal of Communism', expecting artists, writers and the Church to serve the Party, advance its goals and be consistent with Marxist-Leninist thinking. * IRAN (RLBP 336), where Christians continue to be imprisoned for their faith as the clerical regime continues to intensify pressure on the Church. 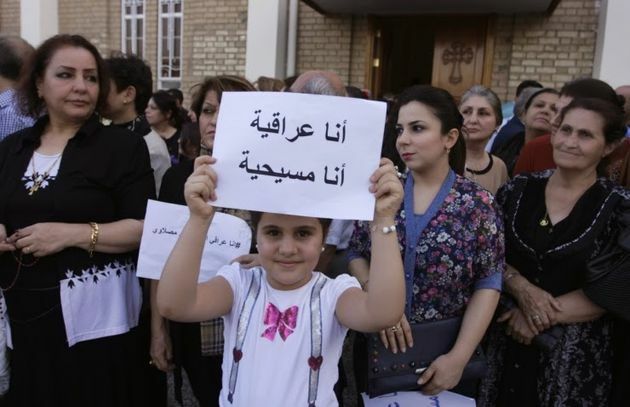 * IRAQ (RLPB 336), where a new National Identity Card law allows the forced Islamisation of Christian children in the event that either parent converts to Islam or marries a Muslim. By this means, Islam will strive (through yet more discriminatory laws) to take Christian children captive into a system they will never be free to leave. Pray against this wickedness. May the Lord protect Iraq's Christian children. The Australian Catholic Bishops' Conference is to go before Tasmania's Anti-Discrimination Commission charged with violating Tasmania's anti-discrimination law which criminalises speech that could reasonably be anticipated to offend, humiliate, insult or ridicule another person on the basis of several categories, including sexual orientation. 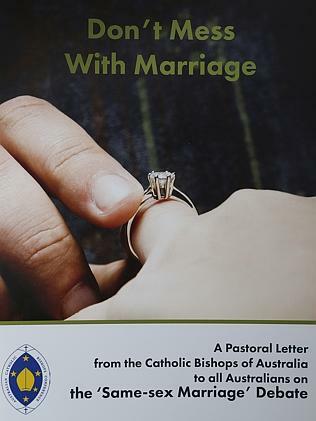 The complaint was made by transgender Greens Party candidate, Martine Delaney, who claimed to feel 'offended and humiliated' by Tasmanian Archbishop Julius Porteous' booklet, 'Don't Mess With Marriage' [see blog for link]. Written in defence of traditional marriage and the rights of children, the booklet/pastoral letter was distributed to parents and teachers in Catholic schools as a means of explaining the Catholic Church's position on marriage and family. It is gracious, sensitive, beautifully written and thoroughly inoffensive. Despite this, Tasmania's Anti-Discrimination commissioner, Robin Banks, ruled on 13 November that the Australian Catholic Bishops' Conference has a case to answer. This is a test case for anti-discrimination law in Australia. Italian Catholic priest Father Piero Parolari (64) has lived in Bangladesh for 25 years, the past 12 of which have been spent in the north-west district of Dinajpur where he works as a doctor in a hospital run by Christian missionaries. On 18 November, when Fr Piero was cycling down to the St Vincent Hospital after morning prayers at the Suihari Catholic Mission, he was shot several times at close range by three men on a motorbike, who then savagely beat him before leaving him for dead. Islamic State (IS) has claimed responsibility. Fr Piero survived and is recovering in hospital [photos]. Pray for the Church in Bangladesh. Despite having won Burma's 8 November polls in a landslide, Aung San Suu Kyi's National League for Democracy (NLD) will face major hurdles. The deeply flawed 2008 constitution was written under military rule and serves military interests. It centralises government and contains 'exception clauses' that give the military the legal right to orchestrate a military coup if the military deems it necessary for the purpose of safeguarding the constitution [see RLPB 236 (13 Nov 2013)]. After independence, Burmese military units throughout the country were required to raise a significant amount of their own revenue to pay salaries and equip themselves. Today, two military-run conglomerates continue to dominate much of Burma's economy. The conflict in Kachin State continues because the Kachin -- a devoutly Christian people -- want greater autonomy with cultural and religious freedom, while the military wants to exploit Kachin lands, which are rich in jade, timber and water for hydro-electricity. The extreme violence meted out by the Burmese Buddhist military to the Christian Kachin is driven not merely by greed, but by toxic racial and religious hatred. On 15 October (just prior to the elections) the government of President Thein Sein and eight armed groups signed a so-called Nationwide Cease-fire Agreement (NCA), binding those groups to abide by the 2008 constitution. The Kachin Independence Army (KIA) was one of seven groups that refused to sign. After the elections the Kachin observed a massive build-up of Burmese forces around the outskirts of Mohnyin town in south Kachin State. Ground offensives began on 14 November. On Monday 16 November KIA positions were attacked by fighter jets, helicopter gunships and ground artillery. La Nan, who is a local religious leader and Mohnyin resident, told The Irrawaddy that some 300 villagers had fled their homes and were temporarily sheltering in his church. 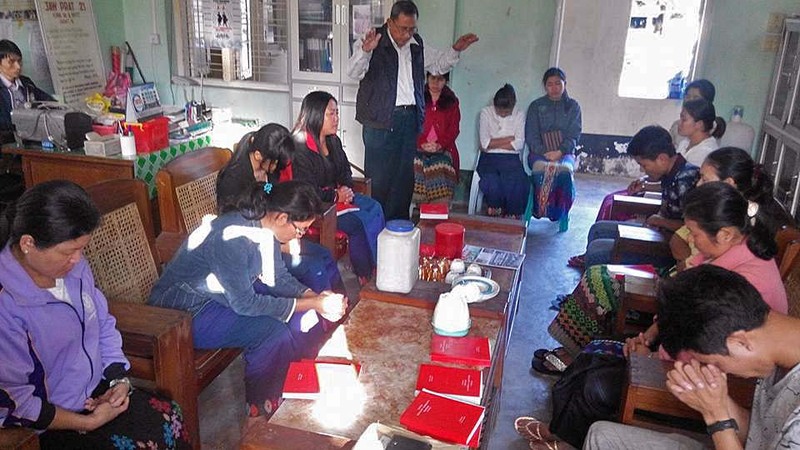 The Rev Lama Yaw of the Kachin Baptist Convention visited areas near Mohnyin and told Morning Star News that Christians in the state capital, Myitkyina, are praying for villagers living near Mohnyin. 'As soon as we heard civilians fled for safety, we held prayer and prayed to God to protect them,' he said. 'We are weak, and what we can do is keep praying and relying on God. We believe that God is capable to protect our people.' 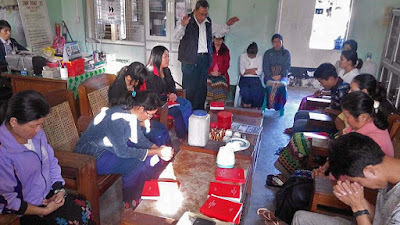 Please join in prayer with the Kachin as they pray for peace in Burma. May God shield Mohnyin, home to many displaced Kachin. Russia entered the conflict in Syria primarily to defend its own strategic interests (in particular its port in Tartus) and fight terrorists (of particular concern are the more than 2000 Russian/'Chechens'). It is in Russia's interests on both counts to preserve the Syrian government, a long-time ally. As Russia has noted, Syria is already providing 'boots on the ground' in the fight against IS and al-Qaeda (just as the Shi'ite-dominated, Iran-aligned, Iraqi army does in Iraq -- with US-support). The Russian intervention has infuriated the US-Turkey-Arab regime-change coalition which is still insisting 'Assad must go', even though IS is poised to fill any power vacuum. That prospect does not bother Turkey, for if the Islamic State of Saudi Arabia is IS's mother -- having nurtured the newborn Islamic State (IS) into being -- then Turkey is IS's father, manager and business partner. US Vice President Joe Biden was absolutely right when he told students at Harvard University in October 2014, 'The biggest problem is our allies.' As Biden went on to explain, Turkey (in particular) has facilitated the flow of thousands of fighters and millions of dollars into the jihad in Syria. Turkey's border is not called the 'jihadi highway' for nothing. Turkey is also a leading purchaser of IS oil. On Tuesday 24 November Turkey shot down a Russian fighter jet that it claimed had briefly violated Turkish airspace. For the second time in two months, NATO-member Turkey is pressing for a NATO intervention against Russia in Syria. Russian President Vladimir Putin was absolutely right when on 25 November he called the Turkish military 'accomplices of terrorists' and asked, 'Do they want to make NATO serve ISIS?' If NATO intervenes it could facilitate the fall of the Syrian government; a genocide of Alawites, Christians and other minorities, and Syria's descent into a Libya-style chaos. This is precisely what some people and governments actually want. Please pray for God to intervene in Syria, a centre for Christianity for 2000 years, where 'the disciples [followers of Jesus] were first called Christians' (Acts 11:26 ESV). Iranian authorities first started harassing Maryam Naghash Zargaran (37) in February 2011, angered by her conversion to Christianity and her active involvement in Iran's house church movement. In early 2013 Maryam (also known as Nasim) was charged with 'Propaganda against the Islamic regime' and imprisoned for 19 days before being released on bail. In July 2013 the court pronounced Maryam guilty of waging an 'anti-security agenda to spread Christianity in Iran in order to pervert Iranian society from the way of truth [i.e. Islam]' and sentenced her to four years in Evin prison. Maryam suffers from a congenital heart condition and had surgery nine years ago for Atrial septal defect (ASD) [commonly known as ‘a hole in the heart’]. Maryam's health has deteriorated significantly in prison. On 29 September 2013 she had to be hospitalised for urgent heart treatment. In late October 2015 she was granted medical leave again, but within days was ordered back to prison, mid-treatment. Maryam needs our prayers. Middle East Concern (MEC) reports that on 1 November security agents raided a house church in Varamin, south-east of Tehran, and arrested at least thirteen of those present. 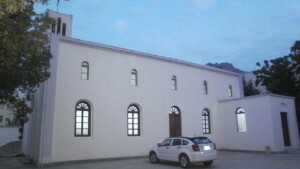 The following day another Christian connected with the house church was arrested at his home in Tehran. MEC reports: 'Many of those arrested were formerly members of Emmanuel Protestant Church in Tehran, which was forced to stop its Farsi-language services in 2012, resulting in the formation of several informal house churches.' The condition and whereabouts of those arrested remains unknown. Family and friends are requesting prayer. The Iraqi parliament has moved to Islamise Iraq further with a new National Card law. According to Article 26.2 of the National Card law, '... children shall follow the religion of the converted parent to Islam.' In other words, if a Christian father decides to convert to Islam -- say, to get a job or a second (Muslim) wife -- then his children will be registered automatically as Muslims. Likewise, if a Christian mother -- maybe a widow or divorcee -- marries a Muslim man, then her children will automatically be registered as Muslims. Considering that Islamic law regards apostasy (leaving Islam) as a capital offence and obliges Muslim women to marry Muslim men, this move is significant. Christian children are at risk of losing their religious freedom purely because of a parent's decision. Christian and other religious minority MPs proposed the following amendment: 'Minors will keep their current religion until the completion of 18 years of age, when they have the right to choose their religion.' But this was rejected and on 27 October the law was passed in the Iraqi parliament by a vote of 137 to 51. After the vote, religious minority MPs walked out of the chamber in protest. * the presence of God's eternal and omnipresent Spirit will be palpable inside Iranian prisons -- both to the believers and through the believers; may the Lord our Shepherd guide Iran's at-risk illegal house churches and the Lord of Hosts protect them. * Jehovah Rapha -- 'the Lord who heals you' (Exodus 15:26) -- will watch over, protect and preserve the lives of his precious, cross-bearing children in Iran and Iraq as they endure war, imprisonment, harsh conditions, displacement and separation from family and church friends because of the name of Jesus. Please pray especially at this time for Maryam Naghash Zargaran -- may the Lord uphold her. UPDATE SYRIA: In August, IS forces captured the mostly-Christian town of Qaryatyn and the nearby Assyrian village of Hawwarin, both midway between Palmyra and the strategic Damascus-Homs M5 HWY. 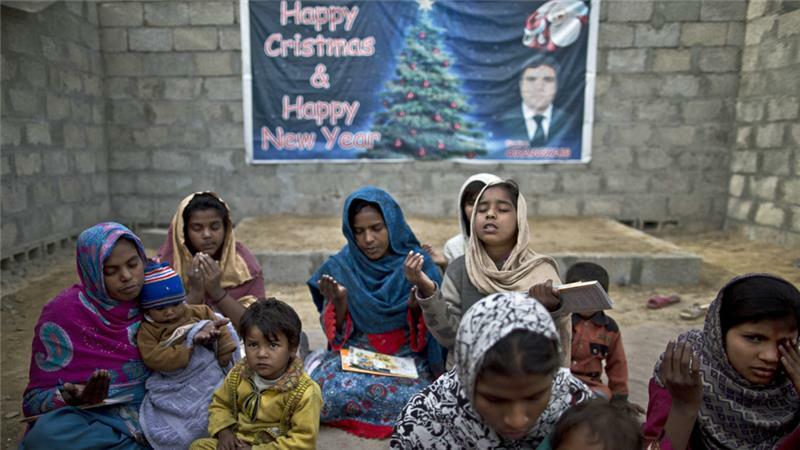 Though Christians fled, some one hundred Christian families remain captive in Qaryatyn. [See RLPB 322 (12 Aug) and RLPB 331 (13 Oct).] Stratfor Global Intelligence reports that Syrian government forces have re-taken several villages close to the eastern side of the M5. They are now preparing to defend Sadad (a Christian centre, now largely evacuated), and, with Russian air support, advance on on Qaryatyn and Hawwarin. May God be a shield around the remnant and captive Christians, and may their towns and villages be liberated. Pressure is mounting on Christians in Iran and Iraq as Iran ascends and Western influence declines. In Iran, Farsi-speaking ethnic Persians face imprisonment if they convert to Christianity or participate in Farsi-language witness, or worship in secret house churches. 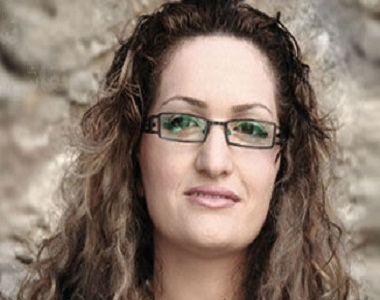 Convert Maryam Naghash Zargaran (37) with a heart condition is part way through a four-year sentence. She urgently needs prayer. Since 1 November 14 members have been detained when officials raided a house church in Tehran Province. Meanwhile, the Iraqi parliament has passed a National Card law mandating that, if a Christian parent converts to Islam or marries a Muslim, their children will be registered automatically as Muslims and subjected to Sharia provisions. Christian children are thus at risk of forced Islamisation. 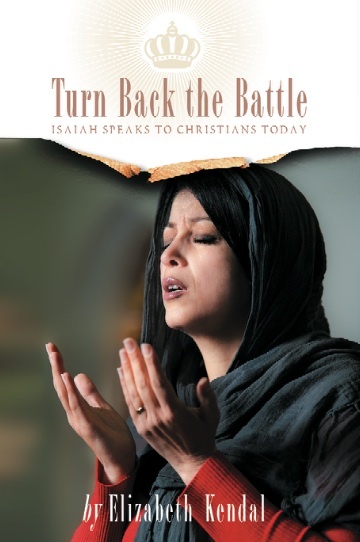 Please pray for Iran and Iraq and their Christians. RLPB 335. 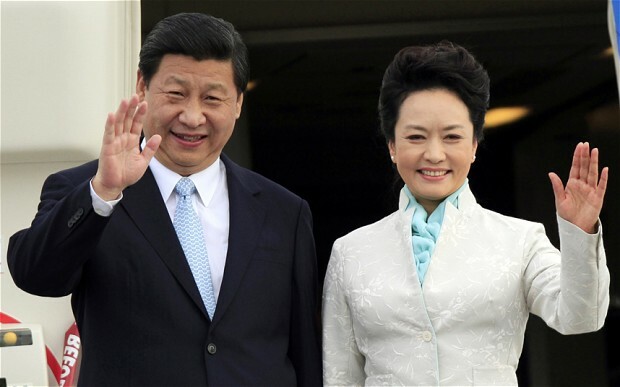 China: Repression and Censorship; Xi and Mao. CHINA: REPRESSION AND CENSORSHIP; XI AND MAO. -- Includes updates on Assyrian captives, and Aleppo crisis. On Tuesday 3 November officers from China's National Security Bureau raided the home of Zan Aizong, a Christian Zhejiang-based writer and member of the Chinese Independent Pen Centre. 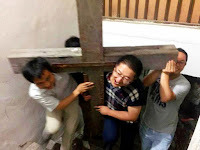 A former reporter and Zhejiang consultant for China Ocean News, Zan Aizong has been blogging on religious freedom and cross demolitions in the coastal province of Zhejiang, critical of Chinese Communist Party (CCP) policy. Zan was temporarily detained, questioned, intimidated and threatened. 'Please ask for the Lord's mercy,' he wrote upon returning home. 'Today, I was accused on suspicion of subverting national security [an extremely serious charge], and my cell phone, computer, etc., were confiscated. After this matter was recorded, I was free to go home for the time being, but I cannot speak and I cannot post on WeChat again. I would like to thank Jesus Christ for his grace and help ... I do not have any hatred towards any person ...' Zan Aizong is in a very delicate and dangerous position -- as it seems are all who dare criticise CCP policy these days. Meanwhile, Zhang Kai, the Christian attorney who was providing legal counsel to churches in Zhejiang, remains 'disappeared' [see RLPB 325]. 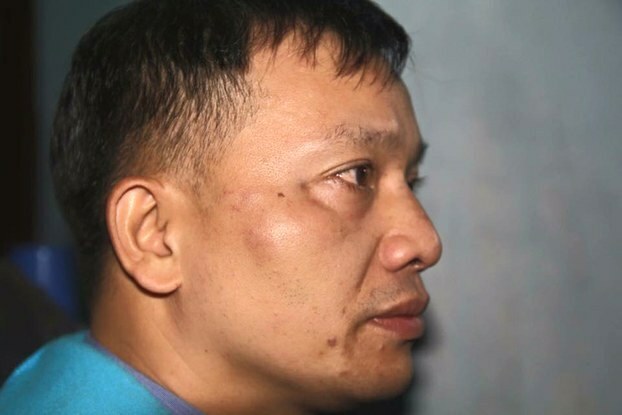 He is one of an estimated twenty Christians from Wenzhou and Jinhua (two cities in Zhejiang) to have been taken into China's 'black jails' since 25 August -- and certainly the most high profile. Black jails are secret prisons in unknown locations where high value prisoners are interrogated, abused and tortured while denied access to family, a lawyer or medical care. On 4 November the family of Zhang Liumao, a human rights activist in the southern province of Guangdong, was informed of his death in custody. According to the CCP mouthpiece, Xinhua, Zhang Liumao was one of seven members of a 'shadow army' plotting 'sabotage activities' against the state. Allegedly their plan was to 'overthrow the current system through armed rebellion to walk the path of a "democratic constitution".' According to Xinhua, Zhang Liumao was 'the explosive expert in the group,' and had 'nasopharyngeal cancer as a result of long-term exposure to chemicals'. Xinhua claims that Liumao 'showed no symptoms during detention until 11 October' and died on 4 November due to a 'massive hemorrhage after treatments failed'. In reality, Zhang Liumao's activities involved publishing a literary magazine funded by the US government. Liumao had been arrested in the crackdown on 15 August and charged with 'creating a disturbance'. Zhang Liumao's family has not been allowed to see his body and it is suspected he was tortured to death. This is the China of President Xi Jinping. China's detained Christians need our prayers! and First Lady Peng Liyuan. President Xi Jinping is what is known as a 'princeling', a descendant of one of the Chinese Communist Party's founding fathers. As noted by China analyst Willy Lam, Xi has 'masterminded a pronounced shift to conservative ideals that are reminiscent of the Mao Zedong era'. Having openly called for the CCP to 'attain the goal of Communism', Xi is escalating repression at an alarming rate, tightening the noose around writers, lawyers, artists, churches and banning party members from criticising CCP policy. In the spirit of Lenin and Mao, Xi is seeking to have art, literature, media and religion (in reality, everything) serve the CCP. At a symposium on arts and culture in mid-October, Xi told a gathering of artists, actors and writers, that art does not exist for art's sake; rather it should serve socialism and the people and be consistent with Marxist-Leninist thinking. China's First Lady, Pang Liyuan (a former singer and actress) is leading the way by reviving Mao Zedong's favourite musical, the pro-revolution 'White-Haired Girl'. Essentially, all elements of society are expected to unite behind the Communist program. Under Xi, China is taking a big step backwards. Committed to reviving Maoist ideology, Xi is moving to take control of what the Chinese people hear, read, say and see. Censorship is on the rise. And what is the cross removal campaign in Zhejiang if it is not essentially a campaign of censorship? The CCP might be able to stop Chinese citizens seeing the cross, but how will they stop them hearing of it? The situation in China could get much worse yet. * the God of the cross will redeem this campaign of censorship against the cross so it might actually generate interest in the cross; may Christ continue to build his Church in China. * the Lord will have mercy on Zhang Kai and all the believers in Chinese prisons and secret 'black jails'. May the Lord's presence be palpable (Romans 8:31-39); may his strength and comfort be sustaining (Isaiah 40:28-31); may he set the prisoners free (Psalm 146). * just as the Lord redeemed the evil of the Tiananmen Square massacre (4 June 1989) to generate criticism of CCP repression and arouse a wave of interest in Christianity, may he likewise redeem today's escalating repression to generate a whole new wave of interest in the life- and nation-transforming truth of God's word. ASSYRIAN CAPTIVES: thank God that on 7 November, IS released 37 frail and elderly Assyrian captives from Hasakah. Please continue to uphold the remaining captives, and pray for their release. ALEPPO CRISIS: thank God that on 4 November, with the aid of Russian air cover, Syrian and allied forces regained control (from IS) of the Khanaser-Ethyra highway into government-held eastern Aleppo. Please continue to pray for Syria's Christians. China's President Xi Jinping has called for the Chinese Communist Party (CCP) to 'attain the goal of Communism'. Following Chairman Mao's policies, Xi wants all elements of society -- particularly the arts and religion -- to serve the CCP. Criticism of CCP policy is becoming increasingly dangerous. On 3 November Zhejiang-based Christian writer Zan Aizong was detained temporarily, questioned, intimidated and threatened. He had been blogging on the programme of removal of crosses from roofs of churches in Zhejiang. Meanwhile, Zhang Kai, the Christian attorney who was providing legal advice to churches in Zhejiang, remains 'disappeared', having been incarcerated in a secret 'black jail'. On 4 November one of the human rights activists arrested in the August crackdown died in captivity. Please pray for China and for the Chinese Church. Hindutva has turned India into a tinderbox of sectarian tension. Violent persecution is on the rise. The monthly reports from Evangelical Fellowship of India (EFI) make sobering reading, covering incidents raging from destruction of Christian property through to mob violence (pogroms), serious assault and murder. The following are a few samples from EFI's October report, all fully verified and acknowledged as 'the tip of the iceberg'. On 8 September a mob of over 50 Hindu radicals attacked a church in Bastar, Chhattisgarh, beating the believers with clubs, sticks and fists after a village council banned all non-Hindu worship. Two Christian women were beaten unconscious. The Christians are being shunned and boycotted, making living in the village close to intolerable. On 22 September Hindus in Kongud, Chhattisgarh, summoned two Christian brothers to the local temple and demanded they renounce Christ. When they refused, the Hindus beat them, accused them of forceful conversions, vandalised their home and drove them from the village. The brothers complained to the police, who refused to register a case. Despite this, the Hindus are threatening further violence if the brothers do not withdraw their complaint. During the first week of October Hindu leaders in Chattarpur, Madhya Pradesh, ordered Hindus to boycott Chattarpur's 26 Christian families, depriving them of water and other basic services. The Christians are also receiving death threats. On 8 October Pastor Arvinder Singh and his family were beaten almost to death in Phagwara City, Punjab, by a Hindu mob which included their own neighbours. Pastor Arvinder (pictured) was beaten unconscious with a metal bar, his pregnant wife was seriously bashed and their 11-month-old baby boy was thrown onto a pile of bricks, causing him serious internal injuries. Nearly a month later, no police report has been registered. 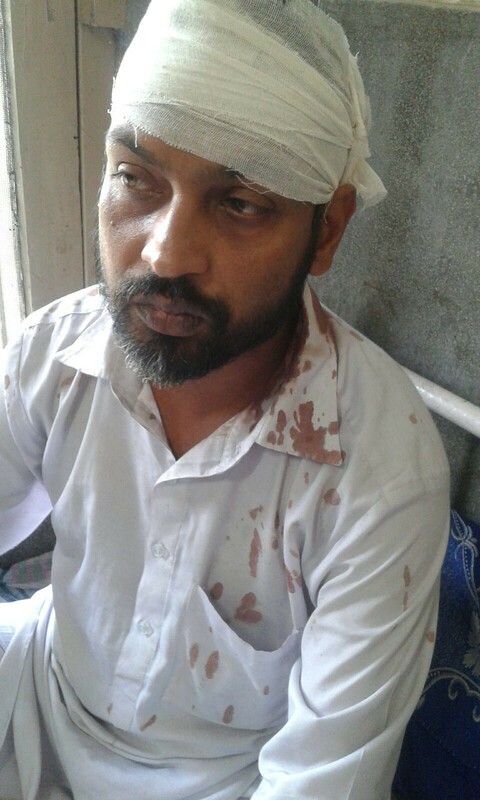 On 12 October the mother of a pastor in Dahod, Gujarat, was stoned by a Hindu mob. Her injuries required hospitalisation. On 13 October suspected Hindu nationalists broke into the home of Pastor Chamu Hasda Purty of the Pentecostal Church in Sandih, Jharkhand, and shot him dead. On 17 October Hindu nationalist youths attacked a 50-strong prayer meeting in Rajnandgaon, Chhattisgarh, and beat up the pastor. 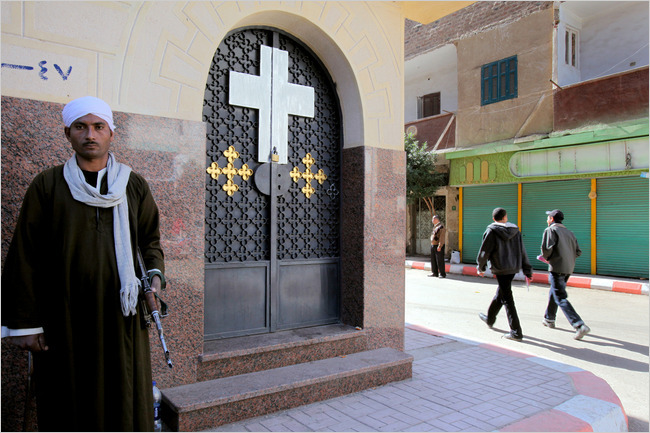 Police arrived and detained the Christians, who were only released after local Christian leaders intervened. On 25 October Pastor Thomas, his wife and two children were among ten Christians arrested in Junardeo, Madhya Pradesh, on false charges of forced conversions. The children were separated from their parents and from each other. While all the adults have since been bailed, the children remain in detention -- John (14) 174 km away in Narsinghpur and Kezia (12) 471km away in Shahdol. * God will be at work amongst Indians, opening their eyes to truths (e.g. 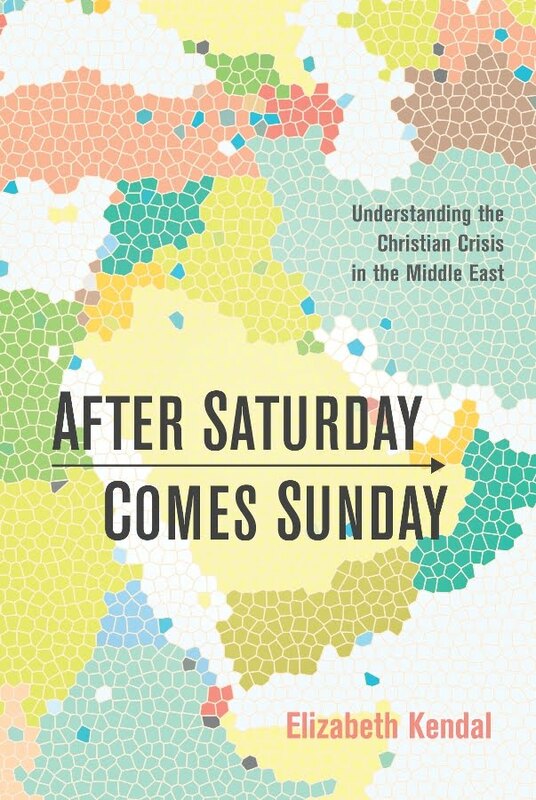 that Christians are doing good works), quickening their minds to discern lies (that Christians are not the enemy), and awakening them to realities (particularly that sectarian bloodshed shames India and threatens the economy); may the people wake up to and reject the self-serving ploys of the Hindu elite. * Christ will build and bless his Church, leading those who need wisdom, comforting those who are traumatised and afraid, providing believers with all their needs, and redeeming all suffering for his good purpose. 31 Oct 2015 is the 498th anniversary of the German Augustinian monk, Martin Luther, nailing his 95 theses to the door of Wittenberg Castle, triggering the Protestant Reformation. Luther was protesting the church's corrupt and exploitative practice of selling indulgences. To empower the people and facilitate reformation, Luther translated the Bible into German, thereby making the truth accessible to ordinary people. Martin Luther did not intend to divide the church -- he hoped for reformation, not division. Today we protest wide-scale church indifference to persecution, noting that Christian solidarity in the face of escalating persecution not only saves lives, it is a powerful witness to the world. PRAY for reformation through a return to scripture. PRAY for spiritual unity (John 17:20-23) and brotherly love (John 13:34-35), that we might stand together around the cross. 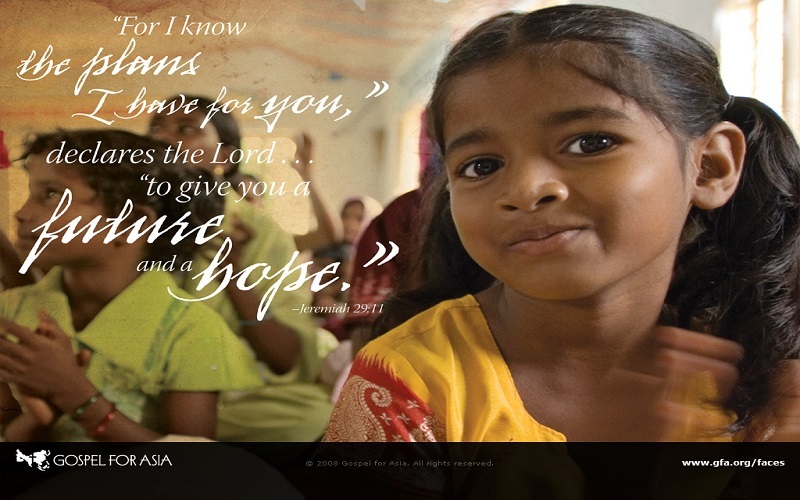 OCTOBER 2015 UPDATE -- During October we prayed concerning . . .
* BANGLADESH (RLPB 330), where Islamic State (IS) claims to be making inroads amongst the radicalised masses, while a local group boasting links to IS have claimed responsibility for the murders of four local bloggers. After IS claimed responsibility for the assassination of two foreigners -- described as 'nationals of crusader coalition countries' -- a call to prayer was issued on the expectation that the Church could be targeted as well. UPDATE: Within hours of RLPB 330 being published, news emerged that Bangladeshi pastor Luke Sarker (52) had narrowly survived an attempted beheading. Rescued by family and neighbours, Pastor Sarker sustained wounds to his neck that required stitching but were not life-threatening. Praise and thank God for his merciful intervention! On 24 October Bangladesh suffered its first terrorist attack on Shi'ites when terrorists infiltrated the Ashura procession in Dhaka's Mughal quarter and left improvised explosive devices in the Hossaini Dalan Shi'ite shrine. 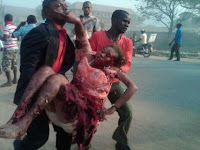 A teenage boy was killed and some 80 Shi'ite worshippers were wounded in the explosions. Though IS has claimed responsibility, the police and government continue to insist that IS has no presence or influence in Bangladesh. The situation is dangerous. Pray for the Church in Bangladesh. * ASSYRIAN CAPTIVES (RLPB 331) held by Islamic State (IS) in Syria after videos emerged in early October of captives in Qaryatayn signing dhimma contracts and of three Assyrian captives from Hasakah being executed. Of the 300 Swedish citizens believed to be fighting with IS, at least half of them come from one city: Gothenburg. [As a comparison, some 250 Americans are fighting with IS, as are around 120 Australians.] Of the 10,000 Assyrians living in Sweden some 3000 live in Gothenburg. On 13 October (just days after the IS videos were released), Assyrians in Gothenburg woke to find threatening messages graffitied on the walls of Assyrian-owned businesses. 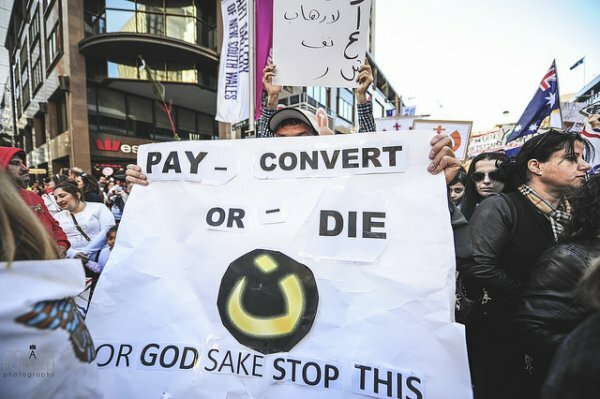 Messages included 'Convert or Die' and 'The Caliphate is Here', along with the IS logo and/or the Arabic letter 'N' for Nazrani/Nazarene (a follower of Jesus the Nazarene) -- the same symbol IS used to identify the homes of Christians in Mosul in July 2014. Pray for the Assyrian community in Sweden. * RUSSIA IN SYRIA (RLPB 332), noting that Russia's bombing raids and provision of air cover were helping the Syrian government drive back al-Qaeda-linked Jaysh al Fateh in the north and Islamic State around Damascus, the population of which has swelled from two million to ten million as Syrians have flooded in to find sanctuary from the rebels. UPDATE: The Syrian government is fighting two main enemies -- al-Qaeda (and its numerous affiliates, some US-armed and trained) and IS. It is also being forced to fight on multiple fronts. Committed as it is to regime change in Damascus -- no matter the cost -- the America-Turkey-Sunni Arab axis has dramatically escalated its support to 'rebels' (most of whom are aligned with al-Qaeda). Weapons are flooding in; in fact rebel use of US-made TOW anti-tank guided missiles has increased 850 percent since the Russian intervention began, causing serious problems for the Syrian government which happens to be the last line of defence for many millions of Syrians, including hundreds of thousands of Christians. Pray for East-West co-operation in the war against Islamic jihadists. Because the M5 Highway into Aleppo runs through Idlib, which is under the control of Turkey-Saudi backed, al-Qaeda-linked Jaysh al Fateh, the government has had to gain access to government-controlled western Aleppo via the Ethyra-Khanaser road approaching from the south-east. On Friday 23 October IS forces attacked that road, capturing at least ten government checkpoints and successfully severing the government's supply-line into Aleppo. This is a major catastrophe for government soldiers, Christians and other loyalists now besieged in the city. Pray for the Church in Aleppo, and that the road will be re-opened. Again, pray for East-West co-operation in the war against Islamic jihadists. 'In the day of my trouble I seek the Lord ... I will remember the deeds of the Lord; yes, I will remember your wonders of old ... You are the God who works wonders ...' (from Psalm 77). A 24-year-old Iranian national has been seriously bashed in a migrant camp in Hamburg for his 'sin' of converting to Christianity. By the time other migrants managed to restrain the attacker -- an Afghan refugee armed with a telescopic baton -- the Iranian convert was unconscious and seriously injured. Pray for Christians in Europe's migrant centres. Pray for a change in policy and that Christians will be housed separately. Of course this would require the authorities to end their ideological and fear-driven denial and admit that Islam really does endanger Christians. 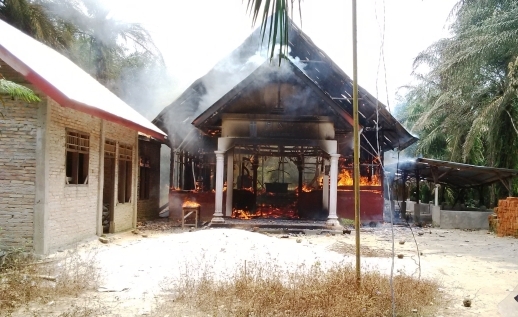 On 13 October a mob of some 700 Muslims attacked and torched a Protestant church in Aceh's southern-most district of Aceh Singkil. They had been incited by hard-liners from the Islamic Defenders Front who are demanding that as most of Aceh Singkil's 22 churches do not have permits, they should be torn down. Permits for houses of worship in Indonesia are granted by local religious harmony forums, which tend not to permit churches in Muslim-majority areas. With tensions soaring, the police picked up sledgehammers and axes and tore down at least three more churches, supposedly to 'preserve harmony'. All church members could do was watch and weep. The pastor of one church with over 100 members said they had applied for a permit repeatedly, but were always refused. Ten churches have been listed for closure; some will be dismantled. With text messages circulating calling for Christians to be hunted and churches to be burned, an estimated 8000 Christians have fled across the provincial border into north Sumatra. Some 1300 security personnel have been deployed to the area. Pray for the Church in Aceh. Morning Star News (MSN) reports that the mutilated body of Samson Nfunyeku, a long-time evangelist, apologist and convert from Islam, was found on 23 September not far from his home in Kalampete village, Kibuku District, Eastern Region. After Samson was killed, his brother, George Mwanika, also a convert to Christianity, started receiving death threats. On 19 October Muslims came to George's house, intending to kill him. George was not home, so they dragged his wife, Mamwikomba, out of the house threatening to kill her if she didn't divulged her husband's whereabouts. When George arrived home he found Mamwikomba unconscious in a pool of blood. 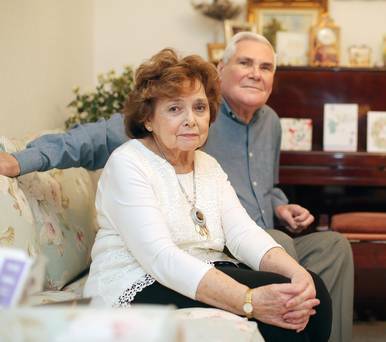 Neighbours helped George rush her to hospital, but she was dead on arrival. Three of the couple's eight children were home at the time of the attack. The whole family is at risk. 'We really need prayers,' George told MSN.